I come from a family of educators; my husband from a family of entrepreneurs. This can make for interesting fodder at family get-togethers. Some conversations are funny, others are uncomfortable, but one such conversation piqued my interest. The discussion centered around “earned income potential” and teachers’ strategic position to boost this potential. 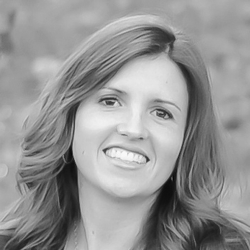 I started thinking…as an educator, when is the best time to invest in your career? How much can a lane change (or two) boost potential earnings? I spent the last couple months collecting and analyzing teacher salary schedules from across the nation. I examined the scales, crunched the numbers, and created the following examples (so you don’t have to!). The results were clear. If you want to increase your lifetime earning potential, you should try to earn as much as you can as quickly as you can, right? It may surprise you to learn how much difference a “lane change” can make over time. Example 1 (below) demonstrates the potential impact of earning your MA and your MA + 30 over a 30-year career. You can make millions in education! Note the percentages of growth in this data, applied from a teaching schedule on the East Coast. 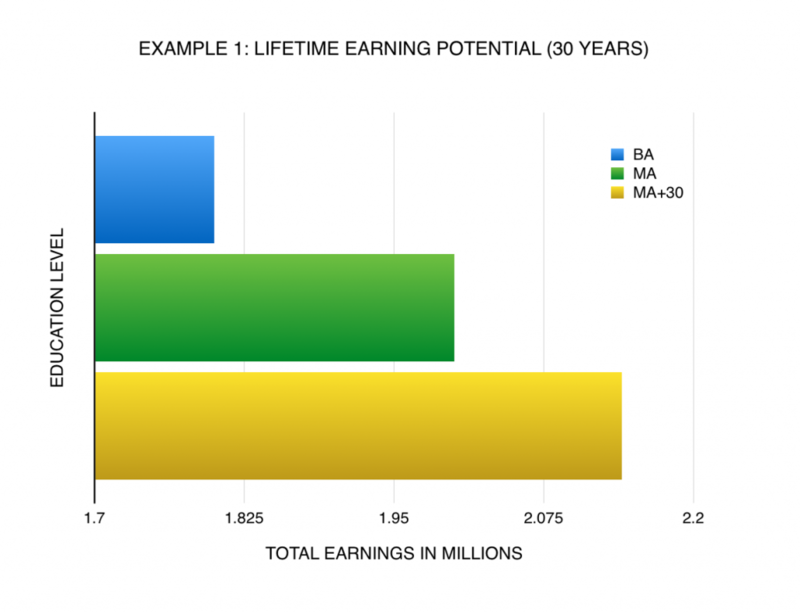 Based on this example, it is possible to increase your lifetime earning potential by 10% if you complete your master’s degree within 5 years of your career, and 20% if you complete your MA + 30 within 10 years. That is an incredible increase! Quick Tip: New teachers should also be leery of what I call the ” holding pattern.” Many districts freeze teacher salaries in the early years (typically around years 3-9). This practice allows districts to entice new instructors with higher base salaries and keep a handle on teacher salaries overall. While I understand why districts do this, it hardly seems fair. If your salary schedule includes a “holding pattern” you could be teaching for 3-5 years (or 13% of your career!) with no real increase in salary. The only way to increase salary during a “holding pattern” is to earn those graduate credits and move horizontally into a new lane. Anyone with 10 or more years of teaching experience falls into this category. At this point, you have most likely surpassed any “holding patterns”, and are looking at a decent, steady pay raise each year. This next sentence may be hard to swallow, but I will explain my logic below: This is the easiest time to invest in your career. Although it may not seem like it initially, by investing your pay raise for one year into graduate credits, before you factor your raise into your budget, you can put that money to work and not “feel” a thing. Additionally, if you are able to move one lane within one year, you will be looking at a larger salary increase the following year… and every year thereafter! This is a great time to shoot for small horizontal moves such as an MA+9, MA +12, MA+18, etc. Example 2 (below) demonstrates how investing in your career will actually pay for itself the following year. Quick Tip: Seasoned teachers should keep an eye out for maximized lane steps. In a nutshell, this means you have been in one lane for so long that the district caps your salary. Some districts offer longevity additions, but not always. If you have reached the end of your lane, the only way you can earn more money is to move horizontally into a new lane. Generally, the farther you move horizontally, the more steps there are in each lane. Investing enough to move one lane could buy you several more years of salary increases before you max out again. Veteran teachers are those considering retirement in the next 5 years. You might think at this point in your career, an investment in graduate credits is pointless. However, many retirement plans are calculated based on the last 3-5 years of earnings. If this is the case for your state or district, the salary you earn at the end of your career could determine the quality of living for the rest of your life! 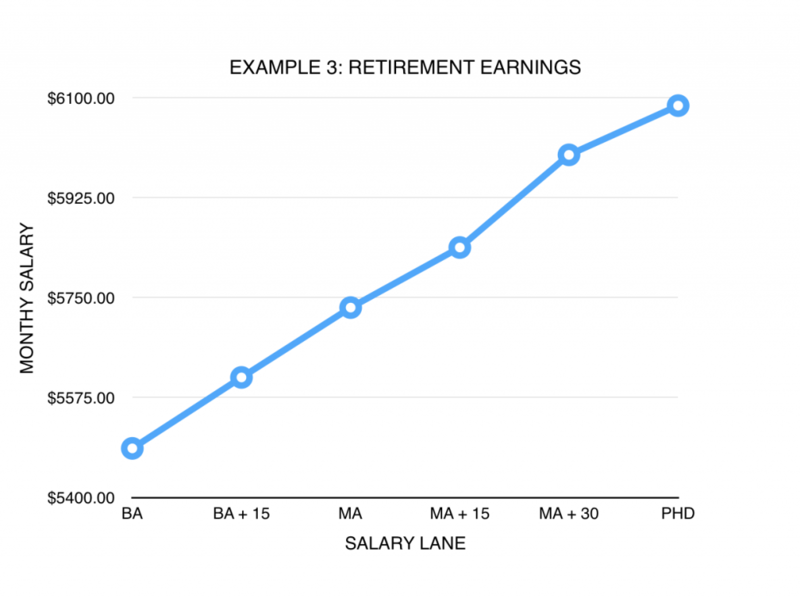 Example 3 (below) demonstrates how lane changes affect monthly retirement earnings. In this example, from the Southeast, it is clear that moving to that next lane can add several hundred dollars to your monthly budget. That might not seem like a whole lot of cash initially, but when you consider the duration of your retirement (pretty much forever!) it can really add up over time. Quick Tip: The best advice at this point in your career is to seek out a retirement specialist in your district and ask questions – the sooner the better. The choices you make are pivotal and will impact you and your family for many years to come. Make sure to get the facts you need to retire at the top of your game! Every pay scale is different, take the time to dust yours off and see how these examples might apply to your situation. I hope I have planted a seed to get you thinking about investing in yourself and your career. As it turns out, I can agree with my in-laws on this one. As educators, we have the ability to increase our net worth and we should take advantage of it! 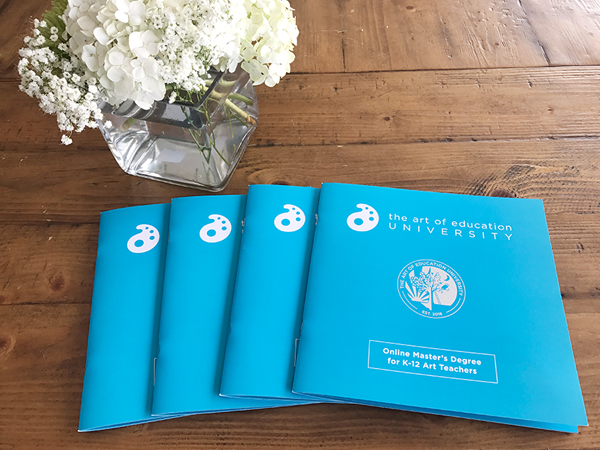 If you’re interested in learning more about graduate classes available at The Art of Ed, click here to visit the Classes page and here to visit the Studio Classes page. What level of education do you hope to achieve? Great read and so very true! I am within a couple of years of retirement and in Iowa they calculate the highest 5 years for my state retirement benefits (IPERS). So glad I was able to take an AOE class online a couple of years ago as I got ready for the “countdown”. Our district scale goes to an MA+40. So glad I hit it! And it is never too late to start that MA either. I didn’t go back to get my master’s until I was in my late 30’s. Timing can be everything. I knew that for myself, if I was going to get it, I needed to complete it before my own children were in middle school and busy with sports, music, etc. I didn’t want to miss out on their activities. I will say, the longer that you wait, the tougher getting back into that study mode can be. 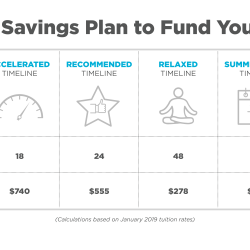 The extra earnings from the lane change the first year paid for not only that year of classes, but also the greater majority of credits the 2nd year that it took to complete the program. Thank you AOE for helping me to accomplish my goals and getting me one step closer to a comfortable retirement! I love your comment about it never being too late. Earning your Masters at the end of your career has long-lasting benefits. 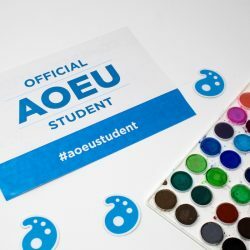 We get a lot of veteran teachers in AOE classes and our feedback indicates that often pushing themselves to take a class or two refreshes them professionally, especially in those busy years! One important thing people forget is that a 10% raise, results in far more than a 10% increase in the money you actually get to spend at the end of the day. Example: If you make 40k per year and you have 35k in fixed expenses, you have $5,000 at the end of the year to spend as you see fit. 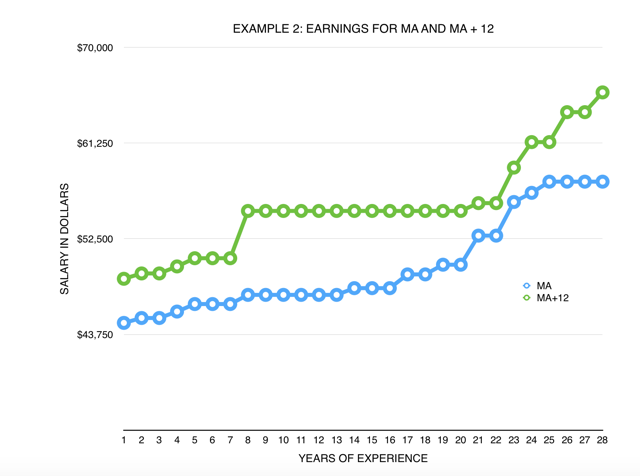 However, if you get a 5k raise as a result of securing your master’s degree or +15, +30, etc. you have effectively DOUBLED your spending money. Now you made 45k per year with the same 35k in fixed expenses, netting $10,000 at the end of the year to spend as you see fit! Small increases in income can net big results if you’re careful not to change your fixed expenses as a result! 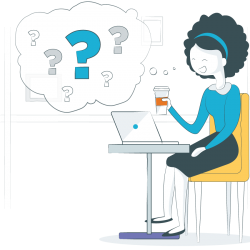 Getting your master’s or at least taking additional credits to move up on your salary schedule seems like a no-brainer, especially since you can do it online now. Spending money is exactly why most Americans don’t have any money. If you truly want to get ahead you need to SAVE money. So instead of spending that 5K bump in salary it is far wiser to save it. Have an account that has a year’s worth of pay in it in case of emergency. Then contribute the MAXIMUM yearly amount into a Roth IRA. If you are 49 or younger that is 5,500 per year. If you are 50 or older that is $6,500. If you have both of those things done, then you can contribute to a mutual fund. Make sure you check the fees that the administrators of the fund charge to manage your account. Just ask them “How do you make money on my money?” Typically they take a fee either when you buy the mutual fund shares “Frontloading” or when you sell them “Endloading”. After much research into my options for a mutual fund investment company my wife and I decided to go with Fidelity because of their low account fees. If you cannot find room in your budget to save money, I suggest getting rid of your smart phone if you are a teacher. You have a phone in your classroom, and a computer, so you are hooked up to the internet at work. Most likely you have internet and cable at home, so the only place you are most likely out of communication range is when you are in your car – and it’s not safe to use it then. Some families spend several thousand dollars a year so they can text each other. Divide your yearly smart phone bill by your salary AFTER taxes to figure out what percentage of your salary you pay to text people from your car. Excellent points on spending money and the importance of budgeting! Thanks for sharing, DB. Slow and steady is a great way to go… when you start early. I started on my masters degree my second year of teaching and finished it in 3 years. It was such a relief to have it done before I had kids. Using each years increase allowed me to increase my earning potential without going into debt. I took the next 7 years and took a class here and there until I reached the highest point on our pay scale. When people say that “teaching doesn’t pay” I disagree. I know it would hard for me to find a job in my community that paid comparable wages to what I earn… doing a job that I love.